As always, A Casual Stroll to Mordor posted an excellent article presenting the content and the different pre-order options. I won't talk much more about that, as it's as complete as it can be, but invite you to read it here: Riders of Rohan Pre-Order Options Announced. I have no idea what this is going to be like, and I think I'll keep away from reading spoilers or whispers on this subject. I like a good surprise now and then. I do think it looks pretty nice and "real" in the trailer and it's very cool lore-wise. The question is if it will really be so much fun to play. When you play your normal character on the floor you have many skills to choose from: all classes are developed to suit a reasonably complicated gameplay. What skills will you have when you are riding a horse? I doubt if it will be as many and diverse as when playing your normal character. Sure, you can increase the abilities of your mount and such (I sense another grind), but I cannot help but make comparisons with skirmishes being released. Back then, skirmishes were announced as "revolutionary" and "each skirmish is different and gives a whole new experience!". I think most people think that skirmishes are actually much alike and are therefore wary when thinking of mounted combat. Nevertheless, mounted combat makes me very curious and I'm looking forward to see what it's going to be like. We don't know how it's going to work yet, but it's potentially something really cool. Apparently, the landscape is going to be almost three times the size of Moria. A new (or, renewed) direction if we look at the previous level cap-raising expansions. Mirkwood (cap raise from level 60 to 65) was miniscule, which was also the most-heard complaint about it (apart from people disliking the dark and depressing). Moria was brilliant, but there wasn't much development afterwards apart from Lothlórien, and people were expecting something more grand. The recent Rise of Isengard expansion (cap raise from 65 to 75) was of course a major change in gameplay, apart from the cap raise also because of the de facto removal of stat caps ("SoA-style"). The expansion was enthusiastically announced with "it has three maps! ", but the actual area covered by those map wasn't that large at all, and players see through that. It looks like they got the message now and have developed a large area to explore. I hope it will be as well-designed and interesting as Moria. This certainly is exciting! It always feels good to be able to level, but I actually have mixed feelings about this. I barely have brought my three raiding characters to the current level cap and am still gearing them up. 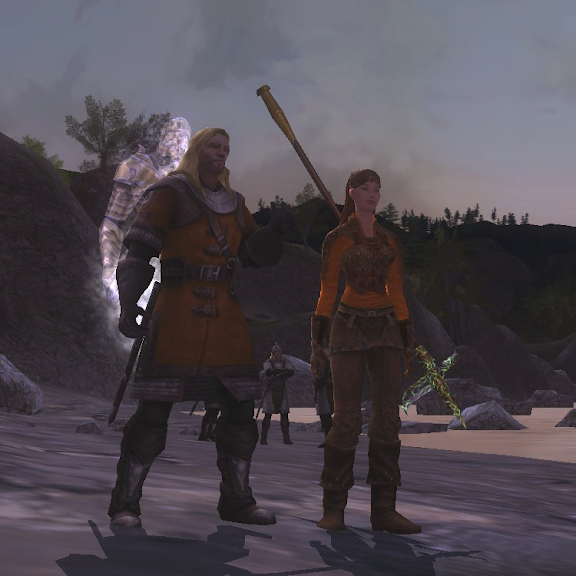 I see around me that most people with a life outside LotRO lacking a leveling fetish often only have one or two characters at level cap as it is. Also, Rise of Isengard end-game content is challenging enough to keep me busy. No one has completed the whole of the Tower of Orthanc on T2 on my server and time is running out. I hope we don't end up in the same situation as during Ost Dunhoth, when only one kinship of my server was completing the total of the raid on T2 on a regular basis. 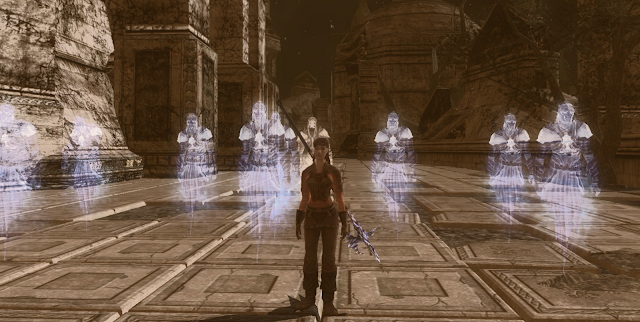 I was very happy to be in that kin and was there when we took down Gortheron T2 challenge mode. It was a great experience and a dear memory, but I'd rather have that everyone would've had the time to enjoy the feeling of having a raid under control. Perhaps I'm getting a bit off-topic now and it's more about end-game (T2) difficulty being raised compared to pre-Ost Dunhoth. Anyway, I'm sure the quest lovers among us will enjoy the coming ten levels. There's another reason I get excited by this announcement, and that is for purely selfish lore reasons. Rohan has always been one of my favorite parts of the Lord of the Rings saga. 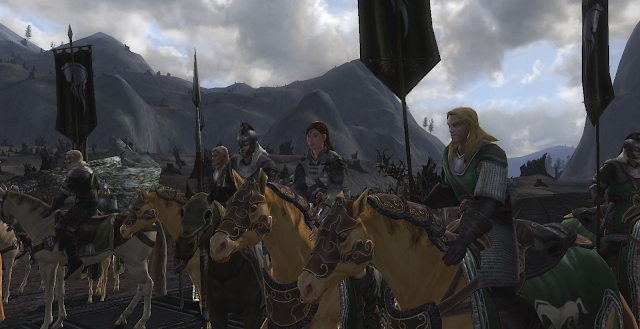 In game I've build my captain (featured in the pictures of this article) around a Rohirrim background: as daughter of a stable-master in Edoras she saw the Mearas and the heroes of her people herself and dreamed of becoming a horse rider. Stubborn as she was, she rode northwards to prove herself as a captain. Since she first explored the neighbourhood of Archet, her biography reads "She hopes to someday return to Rohan" and it seems her hopes are coming true. Meeting with the Rohirrim at the Gap of Rohan and in the Great River area was already cool, but the prospect of actually going deep into Rohan is really exciting. The website also contains some nice pictures and wallpapers. Enjoy! Hm. I admit not knowing anything about the mounted combat besides "We'll be able to fight in our mounts! Woo~" before this. I thought we would still be able to use our normal skills while mounted. But I suppose it makes more sense to have specific skills for it. With that said, yes, depending on the number and their type the novelty of mounted combat may wear off very quickly. Well, nobody knows anything about the mounted combat yet. It could be that you use your usual skills on horse, but rune-keepers fighting from horse? It just seems... odd. But yeah, to be honest, we should just wait and see. Mounted combat could be either real cool or a big disappointment, or anything in between. I guess we could ask the people who bought the legendary edition - the horse session play apparently involves a mounted combat introduction that might give us some clues. Sounds like the bag (and the other Legendary Edition goodies) will be available in the store the same day as launch. Especially interesting to see that Crystal of Remembrance there. Nice that everyone will have access to it, but will it create a standard where people who aren't able to shell out the TPs are disadvantaged gearwise? I don't think so, since it's just a thing that gives you an extra legacy slot. Smells like pay to win to me, so I'm not going to bother with it myself. It would be fine with me, actually it would be pretty cool, if you would be able to get them through the skirmish camp as well - as my boyfriend just pointed out to me, that would be pretty handy for if you don't get the amount of majors needed on your LI's. Anything lessening the terrible grind for LI's in LotRO is very welcome to me, but I'm not going to pay TP for it.